Wfn Fishing Log App – iPod Touch and iPhone Challenging Fishing Application. If you are a dedicated fisherman who catches fish as a pastime or a sport, then WFN Fishing Log App for ipad, iphone and ipod touch is the application for you. Documenting your fishing achievement maybe the one of the most important things that you could ever do as a sportsman. Wfn Fishing Log App is no joke to endure and and face the trials brought about by the weather, the waves, your equipment, and the fish itself, when you caught it. In WFN Fishing Log app for ipod touch, you could even document your winning picture with your caught salmon or trout. This Wfn Fishing Log application makes it very easy for you keep track of your progress. 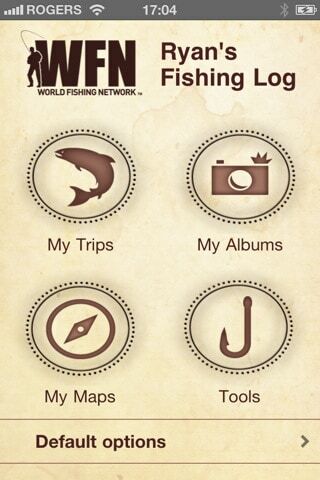 What’s Wfn Fishing Log App About? WFN Fishing Log app has a section on documenting everything the moment you caught your fish—equipment that you used, the number and kinds of fishes that you caught, the weather, and the location you went to. There are tools and maps that you could easily access. You could also accurately document the catches that you made with the different menus shown. You could also set up the initial trip, too. You could use WFN Fishing Log app by having your own WFN account first or just use the application as a visitor without any registration at all. By entering “My Trips”, you could set up your trip as either basic or advanced. The more detailed the trip is, the more advanced your trip is. In Wfn Fishing Log App “Overview”, you could fix the location and date of your trip, as well as the hours you are supposed to be gone. When you choose “Weather Conditions”, basic or advanced weather data will be available for you according to the trip that you have selected initially. In “My Catches”, you could have a photo document of each fish that you caught, the type of bait ,and the equipment that you used to catch it. Again, the more information, the more advanced you get. In Wfn Fishing Log App, you could even go back to your old trips and compare the improvements of your fishing. You could even use the GPS with this Wfn Fishing Log application because of the location entry that you make during your trips. The only downside is the rare crashing of the software that makes you lose the data. But the crashes don’t happen when you enter the fish data first before taking its picture. Where to Get Wfn Fishing Log App? A very unique feature of this Wfn Fishing Log App is the colorful design that goes with your every use. The screens are very well-designed and make you want to enter more and more data each time you use WFN Fishing Log.WFN Fishing Log is really one of the best applications for the fisherman at heart and you should definitely try it! Download Wfn Fishing Log App for your ipad, iphone and ipod touch Here.